The Maruti Suzuki Alto K10 is offered with an AMT (automated manual transmission) unit in two trim levels - VXi AGS and VXi AGS (O). In both the variants, the AMT unit comes paired with a 1.0-litre, three-cylinder petrol engine that generates 68PS of power and 90Nm of torque. The setup returns an impressive fuel-efficiency figure of 24.07kmpl, which is exactly the same as its manual transmission equipped counterparts. The automated manual transmission, or what Maruti Suzuki calls AGS (auto gear shift), has four modes in its configuration - reverse, neutral, drive and a sequential-type manual gearshift setup. The 155/65 section tyres in the Maruti Suzuki Alto K10 VXi AGS come wrapped around 13-inch steel rims and set of full wheel covers. The hatchback is offered with 35 litres of fuel tank capacity, 160mm of ground clearance, 4.6 metres of minimum turning radius and 177 litres of boot space. When compared to the VXi MT (manual transmission), the VXi AGS misses out on two cup holders in the front. Similarly, the VXi AGS also misses out on the driver side airbag when compared to the VXi AGS (O) trim. However, when compared to the LXi variant, the VXi AGS additionally gets an audio system with two speakers, roof mounted antenna, central door locking, front power windows, key off reminder, headlamp on warning, left hand side ORVM, digital clock and rear parcel tray. Maruti Suzuki offers the Alto K10 in five different shades of body paint - Tango Orange, Granite Gray, Fire Brick Red, Silky Silver and Superior White. Out of the lot, only the Superior White colour is non-metallic in nature. Fire Brick Red and Tango Orange body paints are only available on the LXi and VXi trims. The Maruti Suzuki Alto K10 AGS has a couple of direct competitors - the Tata Nano GenX AMT and the Renault Kwid AMT. 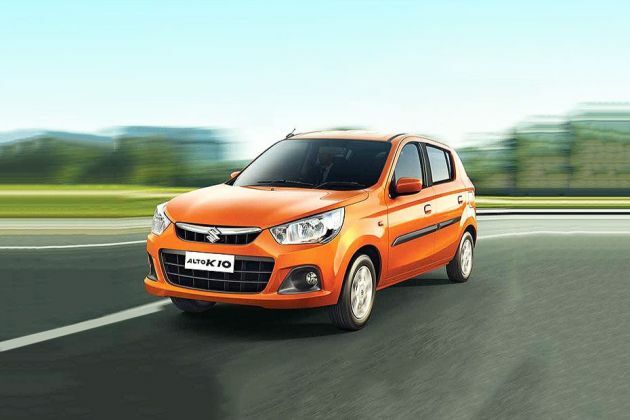 Maruti Alto K10 is available in 5 different colours - Silky silver, Tango Orange, Granite Grey, Fire Brick Red, Superior white. Small and compact car. Av. 22 kmpl in the city for 5 passengers, it's actually good!! Little bit low leg room but due to the low price, it's ok. I am having this car in white color and it has been 3 years but this car has never given me any problem plus its mileage is much awesome. Good condition since 2006. Easy availability of spare parts. Good performance. Good driving comfortability but not for long drives. Most fuel efficient car and very good for city driving, low on maintenance costs, high in performance. Ultimate drive. Maruti Suzuki is the best car forever. Low maintenance, high mileage. Very easy driving. Lowest maintenance. Performance is very good. Boot space is average. But a very good car. Maruti Suzuki sold over 1.07 lakh units of the Alto in the first five months of the calendar year 2017. Alto K10 Urbano is a limited edition available in all the trims and costs Rs. 16,990 over the existing variants.